Crosses of light - signs of new time? Since reading Benjamin Creme's book The Reappearance of the Christ and the Masters of Wisdom, in 1981, I have been in 100 per cent agreement with its message, as I understand it: Maitreya, the Christ, has returned to the world. Recently, drawing on my 50 years of experience in broadcasting, I decided to try to help publicize some of the "signs" that Maitreya and the Masters are placing in the world, specifically the crosses of light, to awaken humanity to the truth that He is here.  USA: Cross of light "a sign of Second Coming"
Since 1986 a new phenomenon appears all over the globe. It began in the U.S. and soon spread to many other countries including Canada, Mexico, Germany, France, Slovenia, Romania, Australia, New Zealand and the Philippines: from one moment to the next suddenly a bright shining cross manifests in the window. The crosses of light appear to be floating in the "air" like a holographic image between a normal window and a light source. Many who see the crosses claim dramatic healing experiences. "Last weekend," the Pasadena Star News wrote on 27 May 1988, "residents reported seeing a cross shining through a bathroom window of an apartment in El Monte [near Los Angeles]." According to the newspaper this was the second cross that had appeared wihtin a week. "More than 3,500 people saw the cross... On Thursday, El Monte police barricaded the street to prevent congestion from cars. People started arriving at 10 am; by 9 pm hundreds remained outside the home. They were allowed inside the front gates in small groups and directed to the proper spot for a look. The lighted cross was the same as the first - shining brightly from a bathroom window". Within days, 12 more crosses appeared around the Los Angeles area. The first cross of light had appeared a week earlier in the apartment of Margaret Romero and her husband, parents of three children. The family wanted certainty and turned to two glazier shops. One of them had been thirty years in the business and assured them that they had never seen anything like this before. Even when the glass was replaced, nothing changed. The cross kept shining. The Catholic parish just had one explanation for it: "A miracle from God ". In March 1991 journalists of Newsday Philippines in Manila were in the editorial office crowding around a piece of glass that had been cut out of window. It was said that a cross would be visible as soon as it was subjected to a light source. This was supposed to happen even in a small piece of the glass. Julian Cruz, editorial journalist of the news service, did not have high expectations about the miraculous content of the glass panes which he looked at together with his colleagues. It was his task to write an article about their joint findings. "With a score of neon lights on and sunlight streaming through two windows, there could be no occasion for hocus-pocus," he wrote on March 22nd, 1991. "A flashlight was pointed at it and switched on and there appeared this even-armed cross of light seemingly within a diamond-shaped aura. Somebody placed another switched-on flashlight beside the first and two crosses appeared. The flashlights were switched off. The crosses disappeared. They were switched on again, the crosses reappeared. The usually boisterous newsroom was silent. Our inimitable funman, Managing Editor Teddy Berbano, who could squeeze out of even the most serious occasion the most hilarious joke, had no punch-line, or any line, this time. As stated earlier, the phenomenon was awe-inspiring, or, at the very least, intriguing. " On November 8th, 1995 the members of a small 135 years old Baptist church in Knoxville, Tennessee (USA) discovered that the light that shone through one of the windows had changed. In the following time the same phenomenon began to appear in all the church windows: an even-sided cross. The crosses were not in the window but seemed to float in the air like a hologram 35 feet away from the building. During the day they appeared in white color. At night with the street light as light sources they also displayed an intense red-golden color. The crosses that appeared on the windows were approximately 4 to 6 feet high but looking through the window they went 40 feet up from the ground into the air. Columnist Bob Hurley of The Greenville (Tennessee) Sun explained to his readers: "I can't get the hair on the back of my neck to do anything but stick straight out these days. The crosses are indeed in the windows at the Copper Ridge Baptist Church. That is a fact. It doesn't matter if you believe it or not. There at first, I was a bit of a skeptic myself. But now that I've seen the crosses of Copper Ridge with these two eyes, I'm a believer." 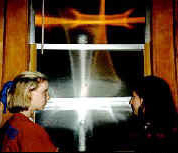 Just before Christmas 1997 crosses of light began appearing in the windows of the flat of the Isatabas family, faithful Aramaic Christians and owners of a Turkish restaurant in Aschaffenburg, Germany. The family has no doubt it is a miracle despite skepticism from the church and neighbors. They had the window glass checked by a glazier and were told that it was impossible that the cross would be caused by the glass. A scientific explanation for the sudden appearance of the crosses of light has not been found. Crosses of light in bathroom windows: Signs of the return of the Christ? Crosses of Light is an award-winning documentary about the mysterious light formations that have been appearing in the windows of homes throughout the world, and particularly in the Los Angeles area where this film was produced. It tells the moving story of the people who live among the crosses and how their lives have been dramatically changed. It also includes interviews with people of various religious faiths, a doctor and a scientist. In 1998 an elaborate study about the crosses of light has been carried out. At the Dutch Technical University of Delft, two third-year students, Carolynne Montijn and Hedwig Rotteveel, from the faculty of Technical Physics, have spent over 10 months on their 'cross of light research project'. The subject was presented to them by their physics teacher. He had been interviewed for a science magazine in connection with 'modern-day miracles' and had become intrigued by the crosses of light, for which he had no immediate explanation. programme indeed provides a good replica of crosses of light. "Our simulation so much resembles reality that both form and size of the refractive pattern look identical to the actual cross. In other words: we have been able to simulate the cross in the smallest detail. Our conclusion is that the change from the normal form into the figure of a cross can be attributed to a change in the refractive index of the surface of frosted glass to exactly 1.561. So, as soon as light bends through glass with a refractive index of this exact number, it displays the form of a cross." "Of course," says Carolynne, "for the sudden alteration of the shape in a window to occur, the surface of the glass somehow must have changed. As the crosses appear all around the world, it is highly unlikely that the abrupt transformation of the pattern has to do with the kind of glass used or the manufacturing process. We had this confirmed by a local glass company. Therefore, although from the point of view of physics we have successfully demonstrated that when the light bends through frosted glass under a specific index of refraction, this particular form of a cross is seen, further research would be necessary into the actual cause of this strange phenomenon. Perhaps it would have to do with minute changes in the surface of the glass, caused, for example, by rigorous cleaning; or, theoretically, the molecular structure of the cross-windows somehow having been altered. To our minds, for this part of the puzzle there must be an equally viable scientific explanation." British author Benjamin Creme claims that the crosses of light are created by a group of highly evolved spiritual teachers - the Masters of Wisdom - who are beginning to take an active part in our daily lives. According to Creme their leader, named Maitreya, is awaited by all religions under different names whether they call him the Christ, Messiah, the fifth Buddha, Krishna, or the Imam Mahdi. Creme says: "The crosses are manifestations by Maitreya. They are radiating spiritual energy into the surrounding area and they are part of the signs, for those who have eyes to see... one of the many signs of His presence in the world. In this way the Christ is making known that He is in the world and very soon will appear before the world." He also relates: "My Master told me in April  that very soon the Christ would manifest crosses of light all over the world in such numbers that they would draw enormous attention. People would not be able to understand their source but there would be so many it would not be possible to ignore them. People would see that they represented something very important that had a significance altogether unusual in the world." Full Review of the Documentary "Crosses of Light"